Last season, teams from MLB’s two West Divisions won their respective pennants and made it to the World Series. This season, neither the San Francisco Giants nor the Texas Rangers will be flying under the radar. The expectations for both teams will certainly be higher than seasons before. What have these teams done to meet or exceed these expectations? The Giants won the World Series on the strength of their young pitching staff. They were counted out before each series, including the final series against the Rangers, yet still prevailed. As a result, they will be expected to win. The core of Bruce Bochy’s club will go untouched. Tim Lincecum, Matt Cain, and Madison Bumgarner, are all starting pitchers under the age of 27. It is not outside the realm of possibility for this trio to improve upon their already gaudy numbers. Catching these young pitchers is NL Rookie of the Year Buster Posey. Posey was called up in late May and made an immediate impact on the field, batting .305 on the year with 18 home runs and driving in 67 runs. As long as these guys are on the Giants, they will be competing for the division for the division title. The only off-season concern the defending champions needed to address was shortstop. Edgar Renteria and Juan Uribe were in charge last season, and both left via free agency. The Giants signed Miguel Tejada to fill that gap. The only thing good about this signing is that it is only for one season. Tejada will be 37, on the downswing of his career, and will surely continue to see his numbers fall. He should still be able to put up offensive numbers similar to those of Renteria. The biggest question is his defensive play and whether San Francisco can afford to have a liability at the most important defensive position. Realistically, the biggest hump for the Giants to overcome is the impact the extra month of play on their young pitching arms. If the arms remain strong, so will the team. The Texas Rangers are coming off a feel-good year with a ton of great stories and a heartbreaking ending. Center fielder Josh Hamilton, only a few seasons removed from being out of baseball and heavy into alcohol and drugs, took the American League by storm, winning the MVP and leading the Rangers to their first-ever playoff series victory followed by the pennant. Managed by Ron Washington, who had similar demons to Hamilton, Texas seemed like the team of destiny. The Rangers needed to capitalize on their run, as it is unlikely to happen again. Hamilton cannot possibly have a season as magical as 2010 and signing Adrian Beltre to play third base is a poor way to spend the money they failed to give to Cliff Lee. Beltre is going to receive $96 million over his 6 year contract, an average of $16 million a year. Last season he opted to sign a one year deal with the Boston Red Sox at $10 million instead of a multi-year deal with other teams for less money annually. This has paid off for him, but probably will not do so for the Rangers. Beltre is a contract year player. By signing with the Red Sox, he benefited from their ball park and their line up, and proved to be a great move for him. As a result, he had a fantastic year, hitting .321 with 28 home runs and driving in 102 runs. The Rangers would be fools to expect anything near those numbers. Beltre’s only season with numbers better than this was in 2004, also a contract year. That season, playing for the Los Angeles Dodgers, he hit 48 home runs while driving in 121 runs and hitting .334. He only hits when it is time to get paid. Unfortunately for the Rangers, his next contract year will be when he is 37. Other than the two seasons mentioned, Adrian Beltre has never come close to batting .300 nor has he driven in 100 runs. Team president and former pitching legend Nolan Ryan has changed the organizations pitching mentality. His team now lacks the ace they wanted when they failed to retain Cliff Lee. Instead, they turn to another former Cy Young award winner, Brandon Webb. Due to injuries however, Webb has not pitched since his first start in 2009 when he was in Arizona. 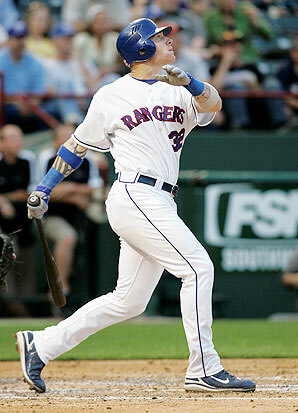 How he bounces back is one question that will impact the Rangers’ fortunes in 2011. With regression from some fantastic seasons in order, the Rangers will be in a dogfight to win the AL West. Dropping to third best is not out of the question.